The professional development school partnership between Side By Side Charter School of Norwalk, Fair Haven Elementary School of New Haven and the Quinnipiac UniversitySchool of Education has received the Exemplary Professional Development School Achievement Award. From left: Christina Pavlak, left, assistant professor in the Quinnipiac University School of Education, Anne Dichele, professor in the Quinnipiac University School of Education, Monica Cavender, assistant teaching professor in the Quinnipiac University School of Education, Beth Larkins-Strathy, associate dean of the Quinnipiac University School of Education, Matthew Nittoly, executive director of the Side By Side Charter School, and Heriberto Cordero, principal of Fair Haven Elementary School, traveled to Washington, D.C. on March 3, to receive the Exemplary Professional Development School Achievement Award from the National Association for Professional Development Schools. 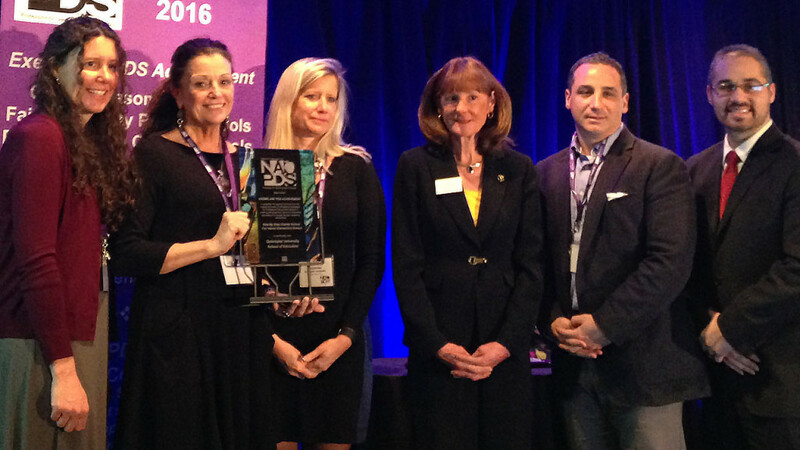 Presented by the National Association for Professional Development Schools at its annual conference in Washington, D.C. on March 3, the award gives national recognition to outstanding school-university partnerships that shape educator leadership and practice. NAPDS commended the partnership for the practical experiences future teachers gain through immersion in schools where complex issues facing urban education are ongoing. Coupled with the emphasis on social justice and equity, this partnership is uniquely situated to develop future teachers with much-needed skill sets, Kiefer-Kennedy said. Defined by specific characteristics, professional development schools are positioned to prepare future educators; provide current educators with ongoing, job-embedded professional development; encourage joint inquiry of education-related issues; and promote the learning of P-12 students. The Quinnipiac partnerships are nationally recognized for their exemplary work in the field of education. The Quinnipiac University School of Education, which is accredited by NCATE: The Standard of Excellence in Teacher Preparation, offers the five-year BA/MAT in elementary education, BA/MAT in secondary education, graduate MAT in elementary education, graduate MAT in secondary education, master of science in teacher leadership, sixth-year diploma in educational leadership, master of science in instructional design and a certificate of completion in special education.